Teun Michiels’ colourful tenore di grazia voice enables him to respect all styles of music for an authentic performance. Aside from the large-scale oratorio repertoire such as Bach’s Passions and Handel’s Messiah, Teun’s portfolio also includes works by Telemann, Mozart, Rossini, Berlioz, Gounod and Britten. In addition, Orff’s Carmina Burana has played an important part in his career. 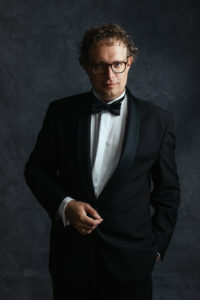 He has collaborated with a variety of orchestras and ensembles, such as l’Orchestre Royal de Chambre de Wallonie, Die Bergische Symphoniker, Euterpe Baroque Consort, La Passione, Nederlandse Händelvereniging, ensemble a, Odysseia Ensemble, Chœur Symphonique de Liège and Schola Cantorum Cantate Domino. In October 2018 Teun recorded, together with pianist Peter Jeurissen, his debut CD “Frühlingstraum”, with songs of F. Schubert, R. Schumann and J. Brahms. This CD marks the “first world recording” of the Chris Maene Straight Strung Chamber Music Grand, an exceptional instrument developed in the aftermath of the worldwide success of the new straight strung piano built by Chris Maene exclusively for Daniel Barenboim. As a vocal pedagogue, Teun enjoys a fast-growing career and has almost 20 years of teaching experience. He founded and is president of Voice.Academy, regularly gives master classes, is guest professor at Fontys Hogeschool voor de Kunsten in Tilburg, and is often asked to partake in juries for competitions, entrance and public exams and festivals (e.g. European Music Festival for Young People, Belfius Classics, etc.). Teun graduated with great distinction from the Royal Carillon School ‘Jef Denyn’ in Mechelen. He was appointed City Carillonneur by the town of Diest in 2005 and for almost 10 years was the youngest musician to have been awarded this post in Belgium. Together with the City Council of Diest, Teun organises the International Carillon Festival of Diest as artistic director, which celebrated its 10th anniversary in 2015. He has also been invited to many countries to play carillon recitals, including Scandinavia, Portugal, Spain, the Netherlands, France, the USA and Russia.